So, we’ve decided to stay in one place for a year or two to save money and plan for our next major road trip. 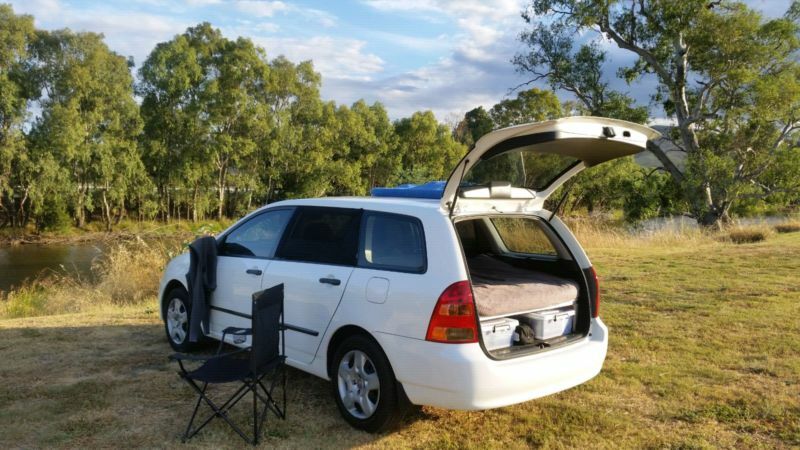 The Delica campervan, as awesome as it is, was simply becoming a big burning hole in our pocket as our driving changed from infrequent highway cruising and bush camping, to more frequent short-medium distance local driving on small winding roads. The reality struck us that we’d need to consider selling it and downsizing to something far smaller, town friendly, and more economical to own and run. Karl, however, lamented to idea of not having a vehicle large enough to sleep inside, or carry a few surfboards or bikes if needed. 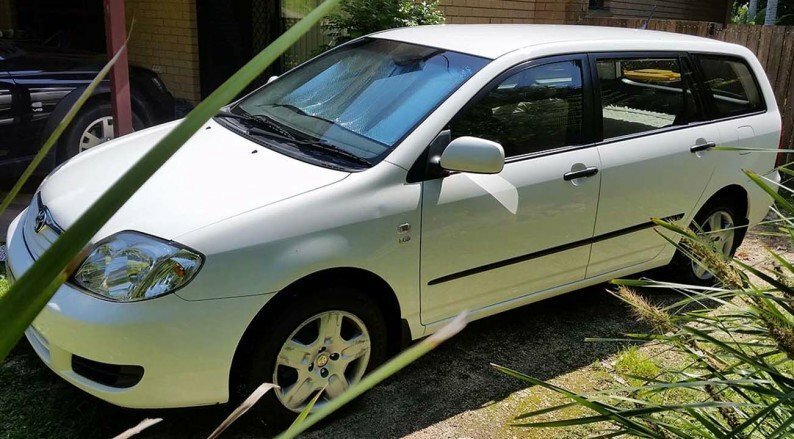 So, after a lot of research, we eventually settled on a beautiful condition, low mileage, white 2004 Toyota Corolla Ascent in a wagon shape. We found out that, if we folded the rear seats down and tilted the front seats forwards, there was enough space to sleep in the back. An added bonus is that it also gets 7L/100KM mixed-driving fuel economy (1.8L petrol engine with 5-speed manual transmission) and was described as “almost impossible to kill” by the local mobile mechanic who inspected it. Evidently he was a Corolla fan. 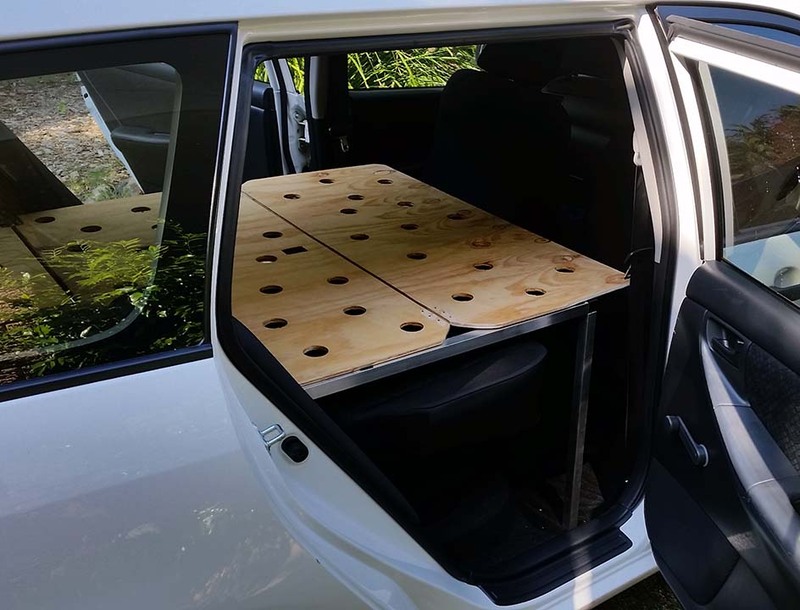 Using our recent experience designing and building our camper conversion for both the Delica and the Montero Sport (in Chile), Karl set to work to hybridise our previous designs. 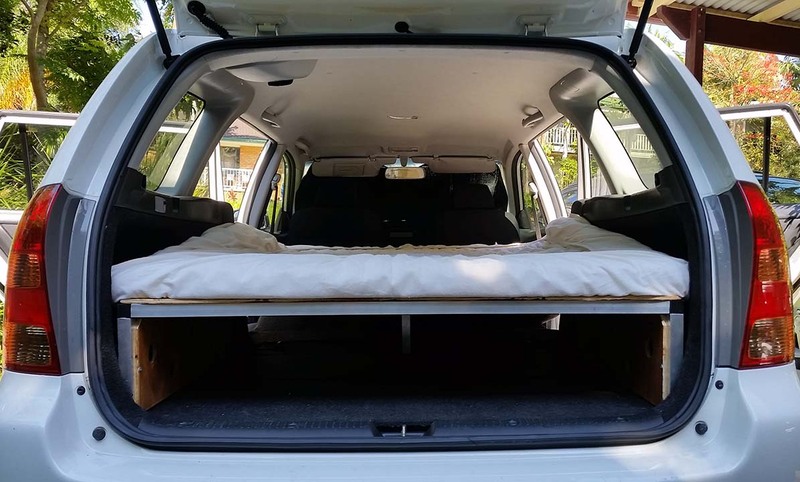 The aim was to design something that would allow the rear passenger seats to be used and sleep two adults comfortably, whilst also being durable, lightweight and stealthy. 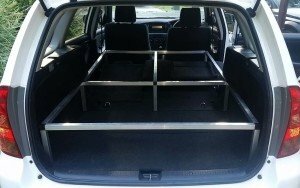 The result was essentially a blended, refined, simplified version of our previous two builds using aluminium square tubing for the main structure, reinforced with 9mm ply, and a fold out system to allow passengers in the rear seats when necessary. We answered a question that had not yet been answered on the internet: Is it possible to convert a Corolla wagon into a camper? Yes, it sure is. The frame is constructed from 25x25mm aluminium square tubing with plastic ‘connect-it’ joiners. 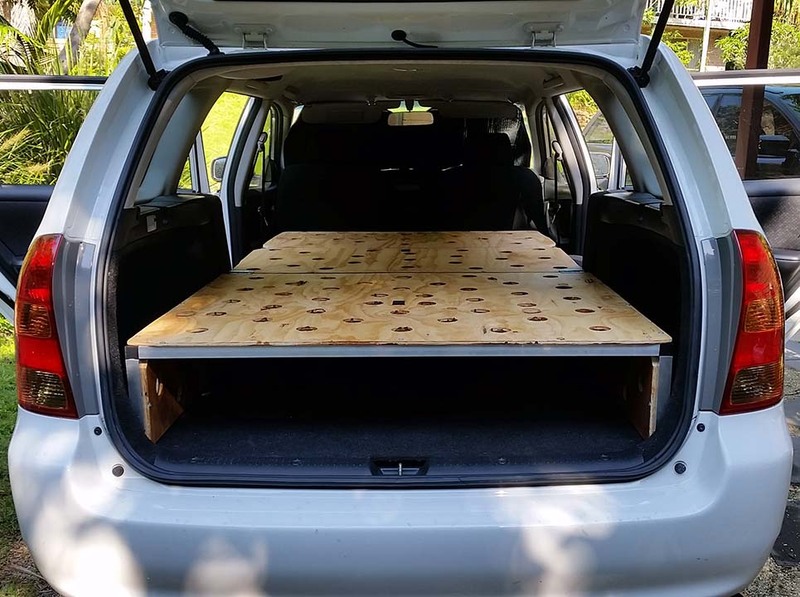 Simply measure the interior, cut the sections to size, check the fit, make adjustments and level as necessary, and then attach the plywood which will add structure, rigidity and a mattress surface area. It is fairly a simple process, but do allow some time for minor adjustments to get the fit and frame levelled just right. The frame packs away and takes a few minutes to install/remove and setup/pack away. Folded out the frame comfortably sleeps two average size adults and still allows for storage underneath. We drilled out ventilation/air holes into the ply, and also put a few coats of marine varnish on the ply to make it more durable, US resistant, easy to wipe clean, and reduce the chance of condensation (which can result in mould forming on the platform or mattress). The front section of ply has two hinges underneath, so it folds under and then back to the boot storage area. Because of the even support from the ply and aluminium frame, a 35mm high density foam mattress plus mattress protector, is comfortable enough to sleep on. This means it’s easier to fold away when not in use. Mesh window socks on the rear passenger windows provides privacy and airflow. We’ll also cut some reflective sun shades to size to fit to the rear windows as required for privacy and/or protection from sunlight. All up it cost around $200 in fuel and materials (excluding window socks and sunshades), plus about 12 hours to design, build, fine tune and finish. Including high grade marine varnish on the ply. Most of the time was spent on fine tuning the design so it fit perfectly and didn’t rub against the seats, plus transport and varnishing. 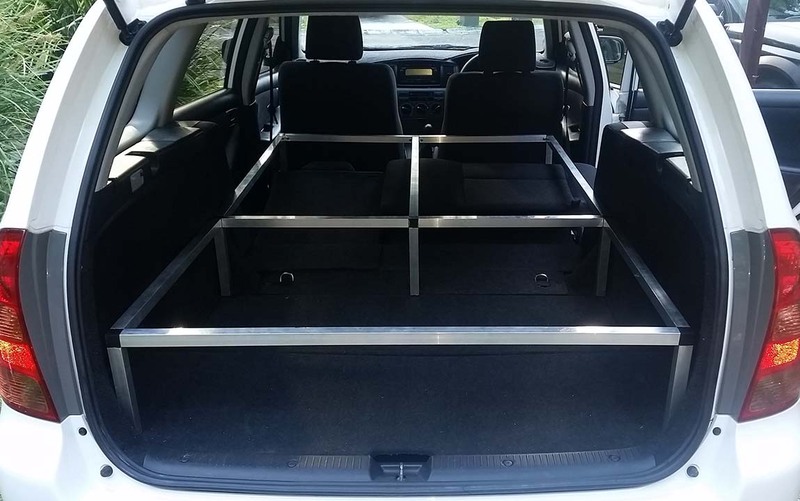 We’ve since build other custom systems of a similar design for the Toyota Rav4, Subaru Outback, Holden Captiva and a few other models and they all worked great. Most camp sites along the east coast of Australia charge $25 to 40 per night. So if you road trip and travel a lot this will pay for itself within a few months. Simple, light weight, durable and compact; what’s not to like? 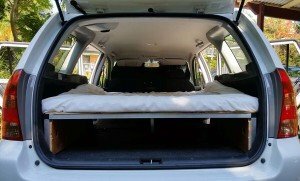 hi guys, I’ve wanted to put a camperbed into our aussie current model honda odyssey since when we purchased it. Using inspiration from your blog and stumbling across the aluminium and connectors at bunnings I’ve just finished our project and am very happy. We’ll try it out over Melbourne Cup Weekend. Thanks for a great blog. Unfortunately we don’t have them on file any more, and quite a lot was done on the fly. I’d suggest around 12m of ally square tube and two sheets of 9mm ply to start off with as there will be some wastage. Good luck and send us the photos of your camper rig when you are finished! Hi, I love the idea und would like to do the same. 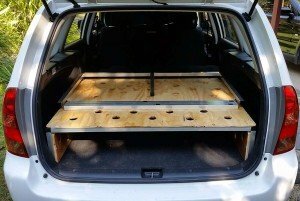 How did you cut the aluminum and the wood? Did you have all the equipment to do that? Cordless circular saw and a cordless jig-saw. Use the correct blade types for wood or aluminum is the best advice. ALWAYS wear gloves, earmuffs and safety goggles when cutting materials especially aluminium as things can go wrong very fast if done incorrectly. It might be a bit of a tight squeeze, I am a little bit shorter than you. It is possible though, if you make the extra fold out section longer, also and tilt both front seats flat to give you the extra length inside. I reckon give it a go and report back on your progress! What’s the length of the bed you’ve made please?